Years ago I made it my quiet-time goal to get to know Jesus better. I thought this meant I’d be focusing on the Gospels: Matthew, Mark, Luke and John. 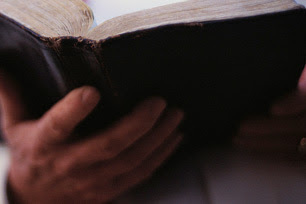 But the more I started praying and digging into God’s Word, He reminded me again that the WHOLE BIBLE is about Christ. Jesus was there from Genesis 1 as The Word, and His message is on every page. The study of Christ is the best study because it reminds me I just don’t need to learn about Him, He is with me every moment. Our relationship continues to grow as I spend time with Him! When I first started having daily quiet time I thought the goal was to learn the most about God as I could. I read commentaries and studied books. Then one day I felt God whispering to my heart, “You know ABOUT Me, but take a moment and just love me. I’m right here.” I still study and dig deep, but I also make sure to just spend time in Jesus’ presence. As a mom with kids-at-home nearly every day for the last 22 years, finding “quiet” time has been the hardest part. I’ve solved this by waking up before anyone else. Currently, with my husband, a college student, a teenager, my grandma, and a 1-year-old that’s the ONLY time it’s quiet. In addition to sitting down with my Bible and journal, sometimes I read while I’m on my recumbent bicycle. I’ll read Scriptures and then close my eyes and pray for various concerns. Other times, I sit on my couch with my Bible, a journal, and a few devotional books. My all time favorite “study” book is Experiencing God by Henry Blackaby. (You can read about how Experiencing God changed my writing life here: http://us148.siteground.us/~triciag6/onwriting.html). I usually write in my journal what God is speaking to my heart, or I write out my prayer requests. It’s great to look back over old journals and see how God answered prayers! For me, it ONLY works if I grab my Bible as soon as I’m awake. If I “just send one email” or “throw in a load of laundry” I usually get distracted and off course. When I sit down I pray and ask God to open my mind and my heart. I ask Him to lead me to the Bible passage He has for me. I also don’t try to rush through just to get it done. God’s revelations don’t come in perfect, 10-minute time slots. The result? I grow closer to God each day and He gives me the peace and strength that I need for every moment. What you shared about your “Quiet Time” will help a lot of people. It can be truly an “appointment with God” as the Holy Spirit leads the way.